Dying for a getaway but just can’t be bothered to make the arrangements to jet off / ship yourself off? Here’s a great alternative if you want to get out of the city life in Singapore and have a taste of our “countryside” – do it soon though, before most farms will be forced to move out by June 2017. TBH I wouldn’t travel here to just do one thing – it’s not worth the effort! Instead, aim to pack a bunch into a day. Here’s an itinerary for you. Would recommend driving because it’s not convenient to get from one place to another! Slap on the insect repellent as well – we got too many mosquito bites. Kranji War Memorial is a hillside cemetery that is quite beautiful in its serenity once you get there. This memorial is dedicated to the many local and international soldiers who died defending Singapore and Malaya against the invading Japanese forces during World War II. 4,458 allied servicemen rest here – with only over 800 identified. 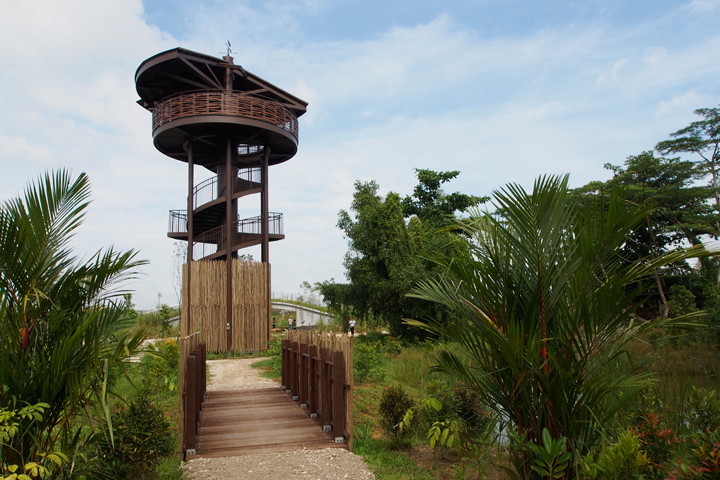 Awaken your senses with a leisurely stroll at the Kranji marshes – note that it’s a 2km walk to and from the observation tower; ok if you have some good company and time to kill. Lunch timeeee. Kranji farm tour starts nao. This place is bustling during the weekend; be prepared to wait! Their warrior platter is just enough for two; dessert of sago and gula melaka was divine. Take a post-lunch walk around Bollywood Veggies to check out the flora and fauna… as well as the very hipster signs (something about a nudist area at the back of the farmland…). It’s rare for us to see where our fruits and veggies actually come from; or a wide variety of plants in walking distance. Think this is definitely an eye-opener and learning experience for kids as well. Wouldn’t be as bold to say that I’m a fan of goat milk – but it’s worth trying for the novelty. To be honest, the farm is a little bit of a let down – the “visiting” area is rather small, and the goats look a bit sad. If you’re interested in watching the milking process, visit at 10:15am – otherwise, take a quick look around, have a quick taste of the milk and you’re good to go. I’ll be honest. I couldn’t bring myself to touch the frogs, let alone eat them, but this is one place you can do the above-mentioned. Apparently frog skin chicharon is a must-try. Farmart has a small section of live animals you can interact with. Again, nothing like a large farm; the animals are all in small enclosures. Before walking in you’ll be greeted by a bunch of bird enthusiasts, showing off their cockatoos, parrots and other species of domesticated birds that you can have a photo opp with. Walk down and past the prawning pond where you’ll find the farm animals. Buy a bunch of veggies for about $2 to feed them – the goats are my favourite! This is probably the cheapest place to get your dead skin eaten by fish. Disclaimer – some professionals (?) have mentioned that it’s very unsanitary to go to a communal fish spa place, with no UV light to kill bacteria. Just make sure you don’t have open wounds on your feet. It’s $10 for 1/2 hr! They have a pond for garra rufa, a tinier species, and chin chin – a larger fish. It takes a while to get used to the tingling sensation of like, 20-30 fish nibbling at your feet; the chin chin were slightly gentler. Not sure if it was psychological, but our feet did feel cleaner after the clean-up! Unwind even more with a beer or cocktail at Bistro Gardenasia – a relaxed outdoor dining area. It’ll be just nice for dinner when you’re done. *Do take note that the menu on Tuesday serves only set lunches, salad and nibbles. You might want to head out to the nearest NTUC or Cold Storage to grab some BBQ-able items (fishballs, crabsticks, sausages) for this next stop. If you are a pro at prawning, you’d probably feel right at home at D’Kranji. If you’re not, then please ask for advice / tips. D and I went in thinking we’d just hang around and wait for prawns to latch onto the bait, but we ended up just catching ONE tiny prawn between the two of us! It’s quite a sad feeling when everyone else around you is catching baskets full of prawns that smell so good when being BBQed! (BBQ pits and salt are provided). 1 hr – SGD 18, 2 hrs – SGD 28, 3hrs – SGD 33.